Russian Academy of Medical Sciences. 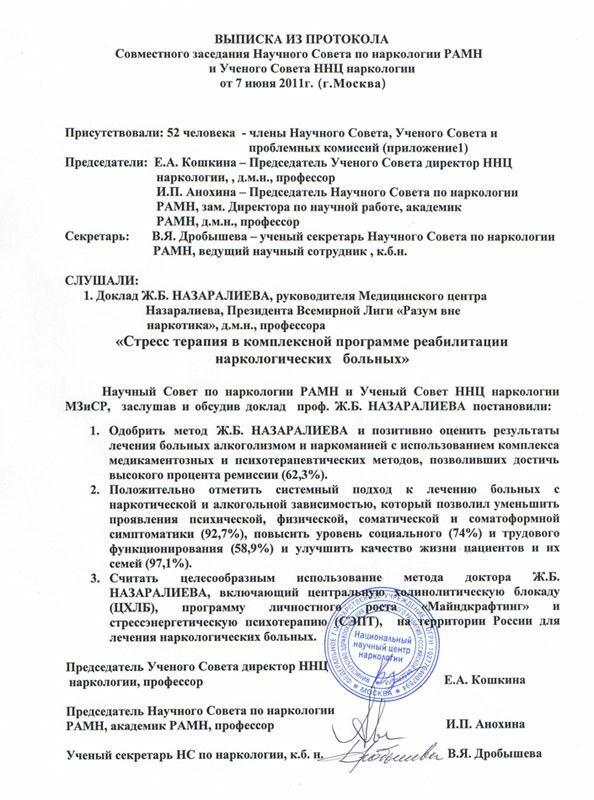 Official recognition of Professor Nazaraliev's treatment methodology. It took over 20 years to develop and perfect treatment technology in order to receive highest scientific recognition in Russian Federation. June 7, 2011 in Moscow, the Joint Meeting of the Scientific Council on Addiction of the Russian Academy of Medical Sciences (RAMS) and the Scientific Council of the National Research Center on Addiction, on which MD, Professor JB Nazaraliev made a vast scientific report representing his author's method of treatment and rehabilitation for patients with alcoholism and drug addiction. According to author’s research, Professor convincingly proves the true value and uniqueness of the method of treatment, which he followed with a late 80 - ies of the last century. Take a favourable view of comprehensive approach to treatment of patients with drug and alcohol dependence that allow reducing presentations of psychic, physical, somatic and somatoform symptomatology (92,7%), increasing the level of social (74%) and occupational functioning (58,9%), improving the quality of life of patients and their families (97,1%). Deem using of method of Dr. J.B. Nazaraliev advisable that includes Central Cholinolytic Blockade (CCB), program of personal growth “Mindcrafting” and Stress-Energetic psychotherapy (SEPT) on the territory of Russia for treatment of patients with drug dependence. Jenishbek Bolsunbekovich Nazaraliev is the president of the "Medical Center of Dr. Nazaraliev ", a member of the Russian Academy of Natural Sciences , a full member of the World Federation for Mental Health WFMH ( Springfield, USA ) , coordinator of the Regional Office in Central Asia, ICAA (ICAA - International Council on Alcohol and Drug dependencies , Lausanne, Switzerland). In addition, Professor Nazaraliev is widely known as President of the World League "Mind free of drug" , the author of a specially developed program «Mindcrafting» which is focused on recharging of body and mind. For the older generation of the post-Soviet space, Doctor Nazaraliev is remembered as the founder of the first non-state Medical Center for treatment of drug and alcohol addiction in the USSR. For 24 years of his medical practice, he has treated more than 16,000 patients suffering drug and alcohol abuse in his clinic, earning the unique title “Doctor Life”. Professor's plan is aimed to heal the sickness of addiction around the world, regardless of their place of residence and social status, as well as global primary prevention, early detection and treatment of drug addiction - a pledge of a healthy future not only in Russia, but the entire population of the Earth.